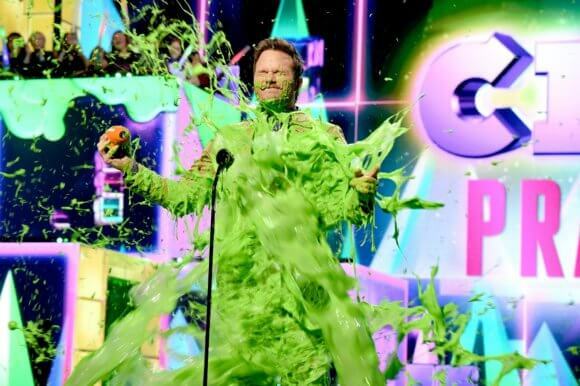 Nickelodeon’s 2019 Kids’ Choice Awards winners were announced on Saturday, March 23rd and among this year’s favorites with younger fans are Ariana Grande, Adam Sandler, Shawn Mendes, Taylor Swift, and Selena Gomez. DJ Khaled hosted the 2019 awards show which included slimings of Aladdin stars as well as Chris Pratt, Adam Sandler, and Josh Peck. DJ Khaled also was covered in slime by the end of the show, as were much of the audience. Among the celebs taking the stage to entertain the crowd were hip-hop trio Migos, performing their hits “Walk It Talk It” and “Stir Fry,” and the original Broadway cast of SpongeBob SquarePants: The Broadway Musical including Allan Washington (“Plankton”), Brian Ray (“Mr. Krabs”), Christina Sajous (“Sandy”), Danny Skinner (“Patrick”), Ethan Slater (“SpongeBob”) and Gavin Lee (“Squidward”).